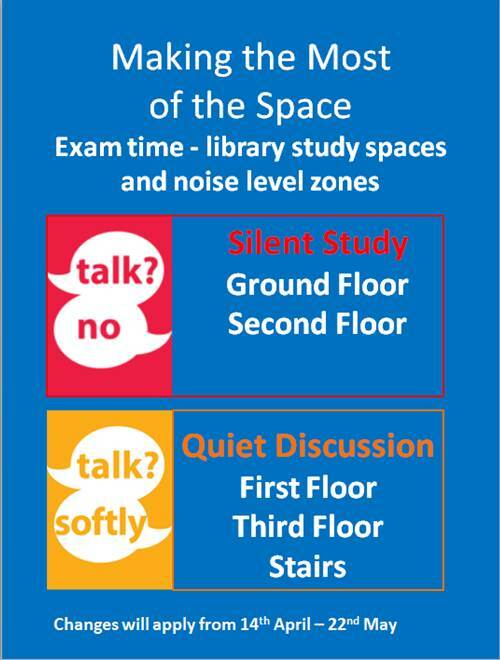 It’s that time of year again when we focus on ‘Making the Most of the Space’ in the Edinburgh Campus Library so we can use the learning space effectively during exam and revision time. During revision and exam time we monitor the space in the Library so we can all make best use of it and provide the best environment for studying. 3. Complaints by students that study desks, and individual study rooms, are ‘reserved’ by other students leaving belongings unattended. Monitoring Study tables and unattended items. Due to the high demand for study tables in the library it is not possible to reserve a space by leaving belongings but not occupying or using it. If students do this then the study table is not available for other students to use. Unattended items are also a security risk. A regular monitoring process will be carried out to identify unattended items and if they are left for more than 20 minutes a yellow reminder will be placed on the table. If after a further hour the items are still unattended, a red slip will be placed on the table and the unattended items may be taken to the library desk for safekeeping and collection.